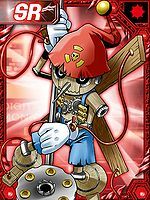 Built from the body of a cursed Jyureimon, it is an Ultimate Puppet Digimon. It is thought that it was probably a single fiendish hacker that constructed Pinochimon from Jyureimon's data. It has an appearance like a marionette, but it can move under its own volition. 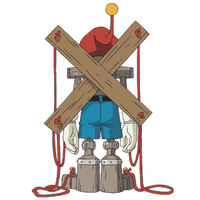 Its personality is detestable, as it tells fibs, and when a computer presents false information, it is the work of Pinochimon. 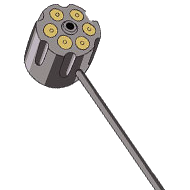 Its Special Move is packing gunpowder into its revolver-style hammer, then striking with its strongest technique (Bullet Hammer). 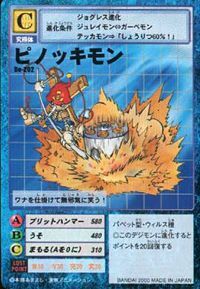 If one suffers this attack, they will probably vanish without a trace, not just from the hammer's blow but also from the explosion of the gunpowder. Small misspelling of Pinocchi, from Pinocchio, the puppet in the famous fairytale. 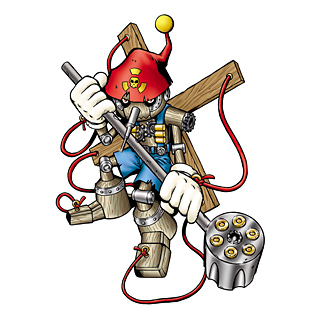 ブリットハンマー Buritto Hanmā Puppet Pummel Packs gunpowder into its revolver-style hammer, and attacks with his hammer or shoots bullets from his hammer. ドリルノーズ Doriru Nōzu Drill Nose Drills the enemy with its metallic nose. Throws its Wood Cross like a boomerang. 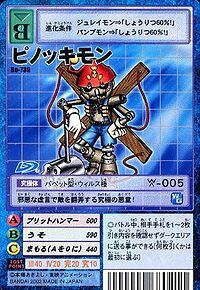 クリーンアップ Kurīn Appu Clean Sweep After hitting the floor with its hammer, strikes the opponent full-force with it, ejecting all the bullets inside it. Kyodai Mokujin  Giant Wooden Man 巨大木人 N/A Big Dutch Doll Creates a big man in the form of a house. Wires come from the fingers controls an opponent puppet. ビッグアライヤー Bigga Raiyā Big Liar Lies, inflicting damage on the opponent. 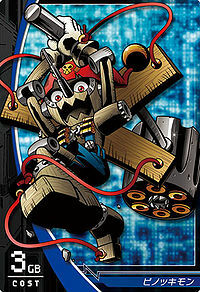 Pinochimon was one of the Dark Masters, a group of four Ultimate level Digimon born of Apocalymon's chaos. While the Chosen Children were in the real world combating Vamdemon, he and the other Dark Masters successfully conquered and reformatted the Digital World, twisting it into Spiral Mountain. He was the leader of the Wind Guardians, and his domain was the forest, in which he lived in a large mansion. Pinochimon was a spoilt and selfish Digimon, trusting no-one, slaughtering his minions at the slightest provocation, and claiming that everything and everyone should go his way at all times. 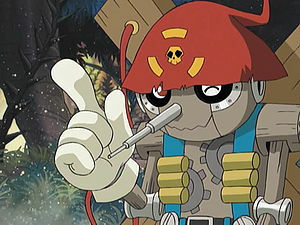 Pinochimon's initial efforts to combat the Chosen Children relied on trickery, using his toys to move them around the forest and allowing Jyureimon to convince Ishida Yamato to turn against Yagami Taichi, resulting in Yamato, Kido Jou and Tachikawa Mimi departing from the main group. When the remaining five Chosen cornered him, he didn't even attempt to combat them himself, instead setting a squad of Red Vagimon and his animated mansion on them, then fleeing the scene. As he fled, he slaughtered one of his Red Vagimon servants which attempted to follow him, and shortly thereafter encountered Yamato and Metal Garurumon. Disgusted by his callous murder of the Red Vagimon, Metal Garurumon shrugged off Pinochimon's attempt to control him and killed him with a point-blank Cocytus Breath. As he died, Pinochimon lamented the words of Jyureimon and still failed to comprehend where he had gone wrong. Pinochimon was a denizen of the Dust Zone. 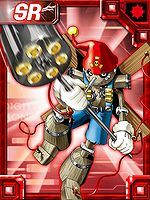 Though initially tricked by Grand Locomon into attacking Xros Heart in exchange for leaving the residents of Dust Zone alone, he had a change of heart and allied with them when Grand Locomon indicated he was not going to follow through on his end of the deal. He later gave Kudou Taiki the Metal Garurumon DigiMemory. 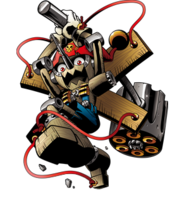 One year later, the same Pinochimon ended up in DigiQuartz and lost control of himself and manipulated several classmates of Akashi Tagiru and Amano Yuu into constructing a powerful robot for his use, Giga Breakdramon. 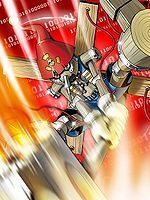 In the ensuing fight with Astamon and the rampant Giga Breakdramon, Taiki and Shoutmon's actions snapped him out of it; distraught with his actions, Pinochimon had Taiki DigiXros him with Shoutmon, enabling him to defeat Giga Breakdramon. Pinochimon is an obtainable Digimon. Evolves from Jyureimon (0+ DP). 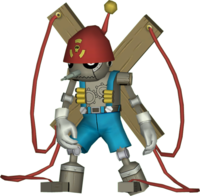 Can be evolved from Mamemon if above level 42 and Machine EXP above 12000, or can be found at Junk Factory. He also gives you a request mission to tell some Digimon that he lied to him at Sky Palace. Can be evolved from Jyureimon at level 41 and evolves into AncientTroiamon at level 65 (with a Trojan item). 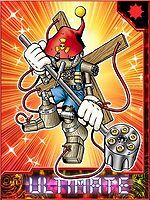 Obtainable by Jogressing Jyureimon or Gerbemon with a compatible Digimon. 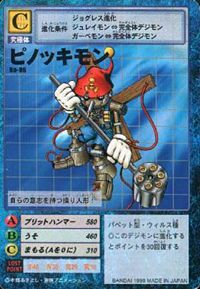 Pinochimon is an unobtainable Leader Digimon. This marionette moves of its own will! 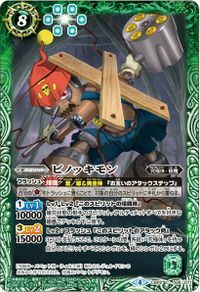 It laughs innocently as it lays traps! This ultimate bad kid spreads evil lies to play around with its opponents! 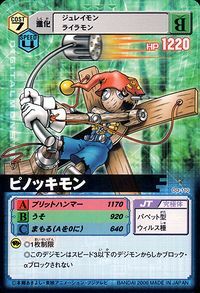 A Puppet Digimon born out of the cursed data of a Jyureimon. Although it has the appearance of a puppet, it is capable of moving on its own and loves telling all sorts of lies. 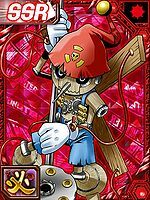 Built from the body of a cursed Jyureimon, it is an Ultimate Puppet Digimon. ↑ 5.0 5.1 Digimon Adventure: "The Four Kings of the Mountain of the Devil! The Dark Masters!" ↑ 8.0 8.1 Digimon Adventure: "Metal Etemon Strikes Back"
↑ Digimon Xros Wars: "Robot Club's Dream, Pinochimon's Temptation"